As children we are often carefree and not afraid to stumble and fall. That first time we are laughed at by another (when we don’t laugh at ourselves for our failure but instead shrink inside with embarrassment) is our first real point where our personal risk taking changes. The reality is that We all live each day with risk – driving our cars requires a certain amount of acceptance of risk that the other driver’s on the road are paying attention. Eating food that was sourced from across the globe requires an acceptance of risk that it was raised in a healthy way. Each day, we take risks without even thinking about it. So why is it that we place such constraints on ourselves when it comes to how we are perceived by others? So many have engrained their lives with fear to fail, that they fail to live. Roosevelt was a man who lived his life often without much fear of failure. His intelligence and knowledge of history allowed him to weigh risk carefully in the decisions he made. There are not many of us who could reference both the Roman empire and Greek Mythology to decide if a law made sense for the short and long-term. Roosevelt could. But with his intelligence came a child-like fascination with life that would find him doing things that others would be afraid to do or be laugh at for doing. He was a risk taker, He loved to try new things. 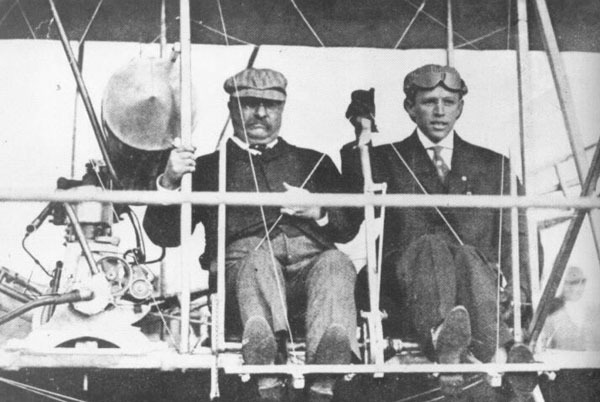 He was the first President to fly in an airplane, but not the comfortable Air Force One. His flight was in an airplane that was known for its danger! He was the first President to dive in a submarine. The list is extensive! Roosevelt was not afraid to be laughed at. He would often stand motionless under a tree in the Whitehouse lawn for hours on end. The Secret Service only stared in amazement, laughing at him trying to figure out what he was doing! Roosevelt was perhaps one of the most knowledgeable bird watchers on the Hemisphere – and this was a form of learning and relaxation for him. Many of his acts on conservation were thought of under that tree! Today, Roosevelt is regarded as one of our best Presidents. He should be regarded as well on someone never afraid to fail.